Patients are at risk for falling. Especially patients who are elderly, have cognitive impairment due to head trauma or take multiple medications. Falls can lead to multiple and serious negative outcomes such as long-term pain, extended stay in hospital or, in the worst cases, death. To reduce the occurrence of patient falls and improve safety, the Falls Prevention Team at Vancouver General Hospital (VGH) has developed a new toolkit and program that will spread across all Vancouver Coastal Health (VCH) sites over the coming months. Planning for the new Falls Prevention Program began in early 2013, following VGH’s accreditation survey in November 2012. At the time, several VGH units were identified as having excellent falls prevention measures in place, but there were inconsistencies, particularly in the various ways falls risk assessments were performed upon patient admission. By August 2013, the new Falls Prevention Toolkit was rolled out, beginning with units where falls were the most frequently reported patient safety event in SLS (Vancouver Coastal’s version of PSLS). Their primary goal, she says, is to reduce falls with harm by 20%. With numerous staff education sessions offered, the majority of VGH staff is now trained on how to apply the new falls prevention standards and report falls into SLS. And, as a way to promote conversations about safety, each unit’s falls prevention progress is displayed under their “Safety & Quality” banner for all staff to see. Congratulations! To the VGH Falls Prevention Team and all staff involved with falls prevention at VGH. You are making a difference to enhance patient care and safety. We would also like to acknowledge members of the VGH Falls Prevention Team who are missing from the team photo above: Nureya Khimani, CNE, Acute Medicine; Margaret Little, CNE, Orthopaedic Surgery; Marilyn Shamatutu, CNE, Acute Care for Elders; Teresa Green, practice educator, OT; Phil Sweeney, practice educator, Physiotherapy; Tena Ganovicheff, PSM, Acute Care for Elders; Lilibeth Ocampo, PSM, Orthopaedic Surgery; Jennifer Keefe, project support, Vancouver Acute. 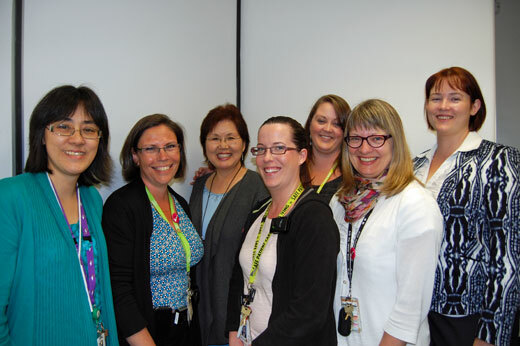 Stay tuned for more stories from The VGH Falls Prevention Team as their initiative continues to spread across all Vancouver Coastal facilities. The new VGH Falls Prevention Toolkit aligns with Vancouver Coastal’s Falls and Injury Prevention Guideline and True North goal to provide best care. Plans to spread the Falls Prevention Program across all Vancouver Health sites are underway. For more information about falls prevention at VGH, please contact joan.chocholik@vch.ca. Congratulations on establishing a comprehensive toolkit for falls prevention. You have a great team at VGH!